The COM Lab School presented a Gold Ribbon Award to Lisa Woitena, College of the Mainland Lab School kitchen manager, for the tenth year in a row. 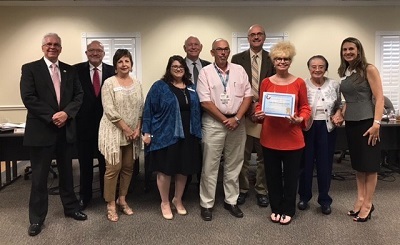 Pictured are (L-R) Dr. Warren Nichols, COM President; COM Trustees Alan Waters, Rosalie Kettler, Melissa Skipworth, Don Gartman; Ronnie Schultz and Marty Entringer with the Galveston County Health District; Woitena and COM Trustees Bennie Matthews and Rachel Delgado. For the tenth year in a row, the kitchen at the College of the Mainland Lab School earned a Gold Ribbon Award from the Galveston County Health District. For 2018, roughly 120 food service establishments have been recognized by the county health district with a Gold Ribbon Award distinction. “Galveston County food service establishments that earn these awards take protecting the health of their customers very seriously,” said Martin Entringer, GCHD consumer health services manager. “We’re happy to recognize these excellent operators.” Entringer and Ronnie Schultz, director of Environmental Health Services for the health district, presented Lisa Woitena, kitchen manager for the COM Lab School, with the Gold Ribbon certificate during the Board of Trustees meeting on July 23. The health district awards this year were based on new qualifications that included recognition by the type of establishment. Those with scores in the top five percent in new categories including, restaurants, bars, convenience stores, schools and mobile units were eligible for awards. For the past 22 years, the GCHD has annually recognized food service establishments that show exemplary compliance with the Texas Food Establishment Rules. While most establishments generally comply with the rules, Gold Ribbon Award winners go above and beyond with compliance. Although this month marks the 22nd year the Gold Ribbon Awards have been handed out, Gold Ribbon Award winners also met the following criteria during the previous calendar year: • Must have no item 1-6 priority violations • Must not have any confirmed consumer complaints • Must have no voluntary or forced establishment closures due to inspection findings • Must have no court complaints filed • Must have no pre-enforcement meetings held • Must pay applicable permit fees on time • Must have operated the entire year in review The health district routinely inspects more than 1,800 retail food stores, mobile food units and roadside vendors in the county for compliance with safety regulations.